A wet and misty morning with strengthening winds improving visibility enough that I can see the loomeries by 11am. I am forced however to abandon the first scroll I started at Bull Hole yesterday evening and take refuge in Elspeth's hide at the Amos. After what seemed like half an hour of human / equipment tetris I manage to compact myself into the tiny cliff top box and find a position I can draw in. My telescope is tilted at 90 degrees from the tripod so I can look down the angled eyepiece, worryingly my head takes on a similar concertinaed stance. However, there is no way I'm going to move anywhere as the rain hammers the hide head on and fills the plastic sheet I have used to block off the section of window, save for where my telescope peers out. 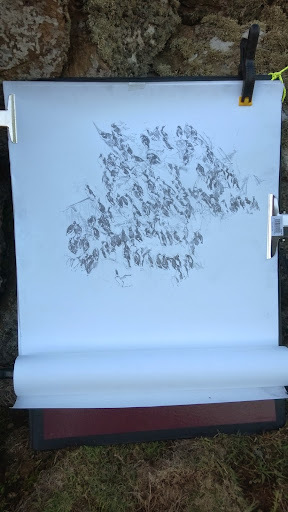 Despite my slight discomfort, The world through its lens absorbs me for hours as I watch and draw the interactions within groups of guillemots jostling for position on an already densely populated flat ledge. 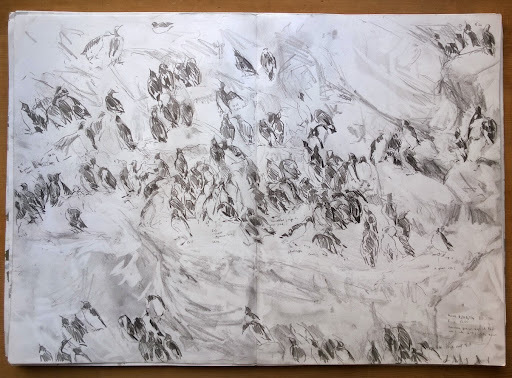 In this period pre- egg laying I find the guillemots appear even more highly charged than I am used to seeing; jostling for position on ledges, shuffling and reshuffling with fights breaking out as birds lash out with sharp stabbing motions at new birds, often centred around pairing birds frequently coupling as rivals (presumably for mate and ledge) challenge and are fought off. Some apparent fights turn into tender allopreening (again courtship I have not noticed later in the season), other birds arrive with fish presumably as a courtship offering, but are mobbed by their neighbours. I imagine a sense of heightened awareness as birds always seem in tune with their neighbours and the network of social interactions threading throughout the loomery. Amidst this frenzy of activity, I discover colour ringed birds, but admit to having difficulty reading the numbers (usually three digits on left leg, T on right). One ring I can read, to the left of the drawing: Green 907. Later Julie looks up G907 on the database for me, it is a male presumably ringed as a chick in 2009 (check) with no subsequent data, which suggest that it is a young adult returned to the Amos for its first breeding season. If it was a bird that had bred previously, I would amongst other things be able to see where it nests on the cliff each year (normally pairs are faithful to the same square metre of ledge)and who it's neighbours are. Bull Hole Scroll at the end of the day. The weather blows over and by late afternoon it is dry enough to continue work on the Bull Hole Scroll. The more I observe the more natural it becomes to draw and I feel the pace picking up after this morning's session at the Amos.